The White Plains motor vehicle accident attorneys at Worby Groner Edelman have years of experience representing clients injured in motor vehicle accidents. At this time of year many people go to holiday parties, either work related, or given by family or friends. Either way, alcohol is likely to be served. There is nothing wrong with having a few drinks, and there is nothing wrong with driving home from a holiday party – just don’t do both of them together. We encourage you to follow a simple rule: if you’re going to drive don’t drink, and if you’re going to drink, don’t drive. In some cases, depending upon the circumstances, even one drink can be too many. Choose a designated driver before you have your first drink. Especially at this time of year, police departments are on the lookout to catch drunk drivers before they can cause even more destruction. District attorneys are known to display no tolerance for drunk drivers, and will prosecute, especially in cases of severe injury or death. 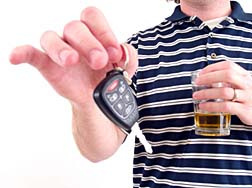 You should also be wary of getting in to a car when you suspect that the driver is intoxicated. Call a friend, or call a cab, or just wait where you are. Use your own common sense and good judgment. If you’re aware of a potential problem, do what you have to do to avoid becoming a victim. We all know about the terrible consequences of drunk driving. Lives are lost, and innocent victims have suffered injuries with lifelong consequences. Poor decisions can lead to a lifetime of regret. If you or a loved one is a victim of a drunk driving accident, call the White Plains motor vehicle accident attorneys at Worby Groner Edelman; in addition to whatever rights you might have in the criminal justice system, you may also have a lawsuit for monetary damages. Whether you do or do not depends upon the seriousness of your injury. In any automobile accident, your medical bills are covered by the insurance company for the vehicle in which you were a passenger. Medical bills for pedestrians are covered by the insurer of the vehicle that hit them. However, even if you’re a pedestrian or a passenger in someone else’s vehicle, your own automobile insurance may also be available to pay benefits. Therefore, you should make a claim under all available insurance policies. You have to enforce these rights quickly, because under New York law, you have only thirty days to file a claim for this type of coverage, called No Fault Insurance. Depending upon the facts of the case, you might also have the right to sue a bar or a restaurant that continued to serve alcohol to an individual when it knew or should have known that he or she was already intoxicated. This type of lawsuit is known as a Dram Shop Action. A lawsuit can also be brought against anyone who helps an underage person obtain alcohol if that underage person causes an accident as a result of being impaired. Contact us if you were the victim of a drunk driving accident, or if you were involved in a motor vehicle accident of any type. Our attorneys are experienced in motor vehicle and drunk driver accident law. We’ll treat you with sensitivity, help you navigate the process, answer your questions, and help to get you any financial damages which the law entitles you to receive. We’ll discuss your rights, identify the applicable insurance coverage, and determine the proper parties to sue. Call Worby Groner Edelman LLP and talk to us; the consultation is free, there is no obligation, and we don’t charge a fee unless we are successful.